I still have my 2nd build kit for the FT Cruiser. I've started using the cutouts as templates and building the plane out of blue FFF. I also started changing the wing design so the wing would be mostly symmetrical. It's gonna take a lot of standing over my cutting table and cutting out the pieces. 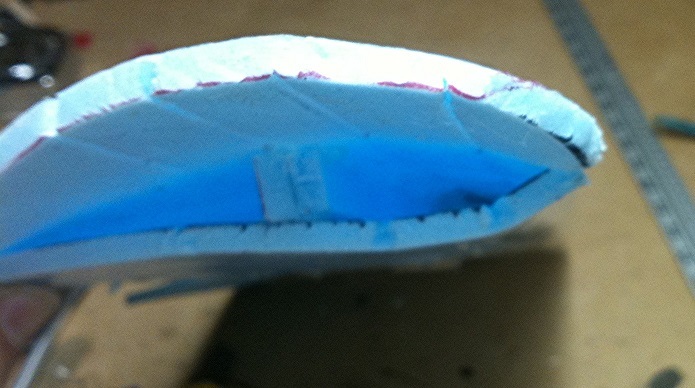 this is a picture of the wing tip. Will be interesting to see how the change works out. Is there any advantage to doing what you are doing? I haven't done anything with this kind of foam before so I really don't know. I like the idea, but have you considered hot-wire cutting the wing using templates?